Friday June 7th 1895 I was sick this morning when I woke up and could hardly get through my morning work. I took the butter in and brought Mother out home with me. I could not eat a bit of dinner. We both slept part of the afternoon. I helped a little with the evening work. Mother staid all night and Will drove to tell the folks. Saturday June 8th 1895 I felt some better this monring and with Mothers help got through the work. I took her home soon after dinner. I did not stay very long but come through town to get some things I needed. Willie Brewer who is sick there at Otts is better. Did my evening work and went to bed early. Will is plowing corn. Sunday June 9th 1895 I did not feel able to go to church and was all the forenoon doing the work. Late in the afternoon we went up to Linders for the teacher. Had a nice visit and a good supper. We hurried home as it looked like rain. Monday June 10th 1895 Will is laid uip with a lame back he hurt with lifting. Oliver picked the cherries for me and I worked most of the day putting them up. There was a hard rain just after Miss Linder came from school. 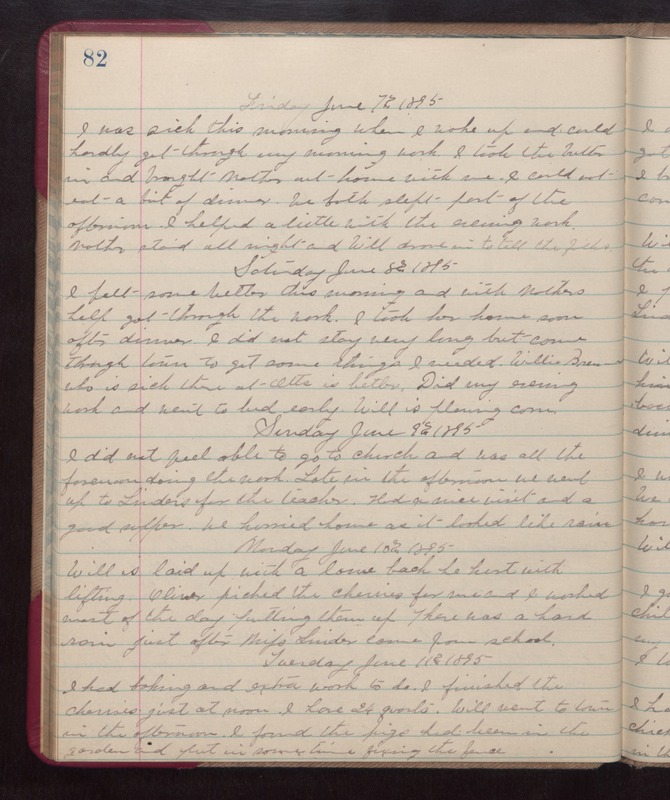 Tuesday June 11th 1895 I had baking and extra work to do. I finished the cherries just at noon. I have 24 quarters. Will went to town in the afternoon. I found the pigs had been in the garden and put in some time fixing the fence.